The weekend has seen heavy downpours interspersed with blue skies and spectacular cloud cover. The rains have meant that I've been in the cafe, the gym, or at home reading and cooking. Saturday afternoon I had a few friends around for an experimental food day. Two of us were cooking while the others assisted as tasters and judges. We'd been planning this for a while, and I'm sure that it will be the first of many. When people started arriving at around 5 we got the cabbages washed off, which in itself is hard work, cooked up the chilli and garlic paste and got our hands (in fact my kimchi gloves) dirty, massaging in the paste between the leaves. This was tasted a little later with the chicken, but really it takes some time to ferment and mature. Next up was a tomato sauce-off. 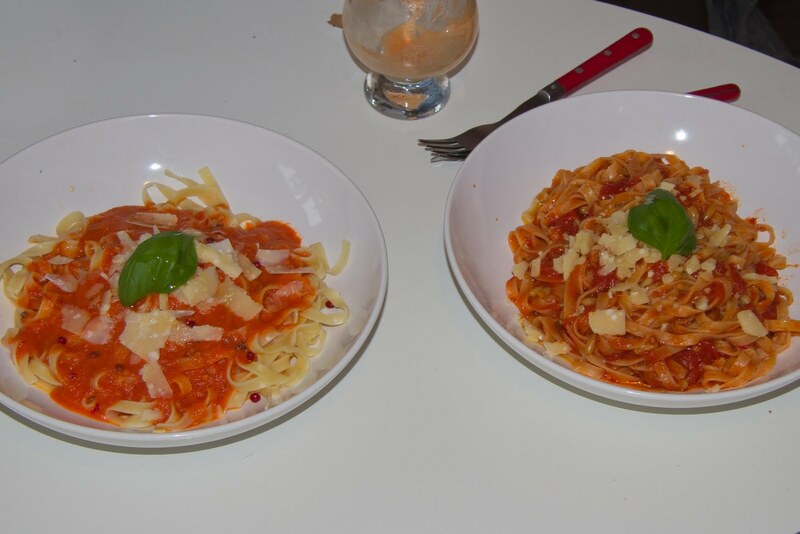 We'd discussed our recipes previously and realised that we had vastly different methods for making the perfect pasta sauce. Mine isn't a classic recipe as such, though the basics are there. I start with an unhealthy quantity of olive oil in a pan, heating slowly and with around three large garlic cloves, roughly chopped infusing their flavour. I cook this up for around five minutes, just letting the garlic start to become translucent but never darken. The caramelised garlic flavours are great for some things (roasts especially) but I think that they add a bitter note to a tomato sauce which isn't good. I usually add a little fresh chilli at this point and then throw in perhaps four medium, quartered tomatoes, slowly bringing up the heat until they start to release their juices before putting a lid on and cooking for around half an hour on medium. Towards the end I add a little brown sugar, salt, and freshly ground mixed pepper corns. Once the tomatoes have really cooked down I blend up the whole mixture which becomes creamy and thick with the help of the garlic and the natural thickening agents in tomatoes. The pectins in tomatoes, together with the sugars (which draw the water away from the pectin) and acids, plus the olive oil bring a creaminess to the sauce which goes very well with pasta without the need to add any dairy. The final touch is a good load of roughly crushed pink pepper corns. Sadly (or not) there was no victor as we had four judges split equally in the blind tasting. The two sauces couldn't have been much more different and this made the choice all the more difficult. Winners or not, it's great to see someone else's take on a simple recipe. Next I cooked up thinly sliced aubergine which had been coated in a spice mixture of coriander, cumin, pepper, garlic and a little birds eye chilli, plus a pinch of salt with olive oil and a dash of balsamic vinegar then roasted in the oven on around 150 degrees C for more or less half an hour. I served this with a little sour cream as a dip. The next recipe (after an intermission of a carrot, apple, ginger and lemon grass juice) was an experiment in pressure marinating. I'd come across this idea about a year ago on a molecular gastronomy blog and had been wanting to try ever since. The original blog in which I read about pressure infusion was here and this had been inspired from this Youtube video. The idea is that by putting meat plus marinade under pressure, you force the marinade into all the air pockets in the meat, thus making a deep marinade in a very short time (seconds rather than hours). Edit: In fact this doesn't appear to be the correct theory - though given the lack of success, it's hard to know exactly what is happening. 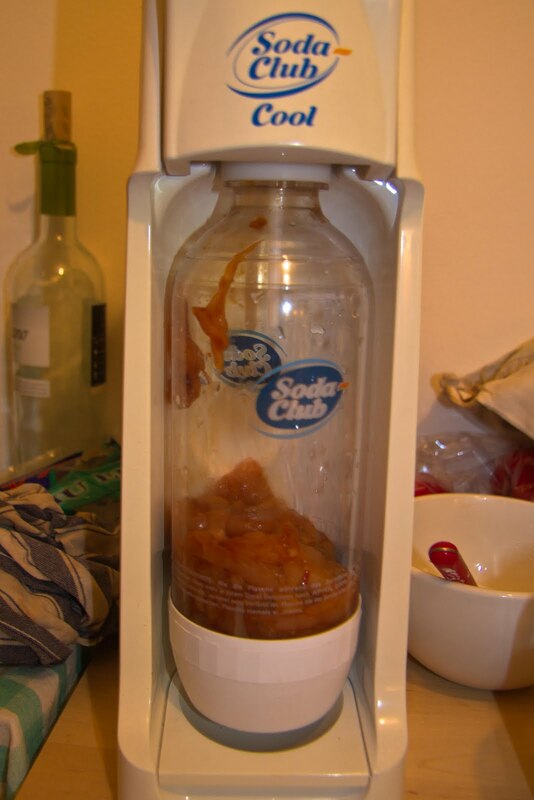 The marinade was a honey, soy sauce, guilin chilli paste mixture and the meat with chicken breast, thinly sliced (so that they would fit in the soda stream bottle). I gave it a blast for a few seconds to build up the pressure before letting it sit under pressure for around a minute. In the mean time we had a control experiment, which was the same marinade having been mixed with the chicken and separated into a non-pressure batch. Apart from the pressure, the two dishes were the same (though I now realise that one of them had gone in the fridge for a few minutes while the other was under pressure - this difference in temperature before cooking may also have been crucial). We got two pans up to heat (sadly very different pans), added a little sunflower oil and gave the two batches a quick stir fry before adding a pinch of salt and a squeeze of lime into each one. The verdict was interesting, though perhaps a damning inditement of our scientific method. In terms of flavour the two dishes were said to be virtually identical. Unfortunately the two dishes used had been of different materials and this probably masked any effect that could have been seen in the different marinating methods (though it was clear that the pressure marinade hadn't made much difference). The chicken cooked in a non-stick pan had given off a huge amount more juice, and thus left the chicken a little dryer, while the stainless steel pan seemed to have relatively little juice after the four or five minutes of cooking. As I mentioned above, the different pre-cooking temperature of the meat may also have had a big effect. 1) On finely sliced meats, the pressure method seems to have little affect as the marinade penetrates the meat very well at the cooking stage and thus no major difference is seen. The first conclusion is thus that one should try this with thicker cuts of meat to see any difference. 2) The material used to cook the meat seems to be a far more important factor than I had realised and we should do some more controlled experiments cooking the same meat in different materials to find the optimum pan. Included in this conclusion is that given the different materials, different temperatures are reached and this again calls for more experiments. 3) The final conclusion on the recipe itself: The marinate wasn't bad and the sweet, sour, spicy mix of honey, lime and chilli with the salt to set it off was good, but not mouth watering - an umami addition (perhaps even a pinch of msg) may bring it out even more. (See here for research on this). Note that msg gets a bad rap, though usual for the wrong reason. 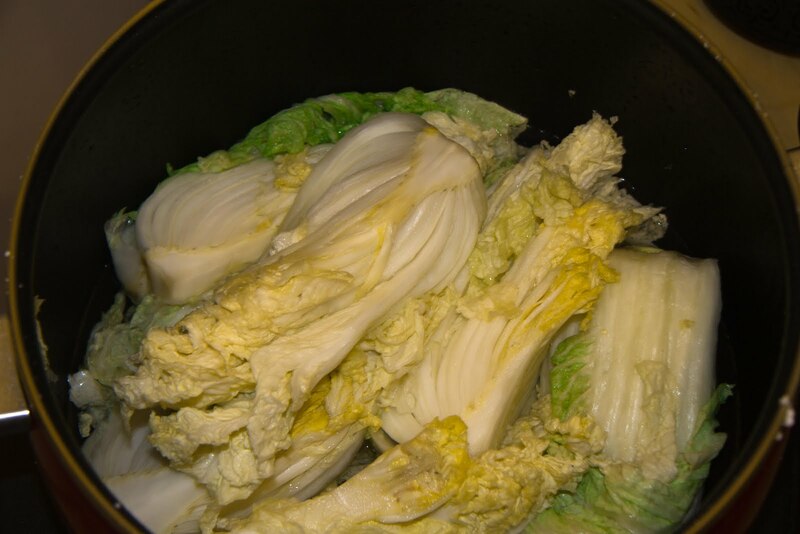 Frequently msg, which is simply a purified form of the flavours found in seaweed, meat and fish sauce for instance, is used to hide bad ingredients. As a cure-all for cheap products it'll give you more problems than solutions, but as a way of bringing together other flavours when you don't want the pungency of fish sauce or the iodine notes of seaweed, I don't have a problem with it. I do try and add something more natural if the alternative is as good, but sometimes it's the right choice to make. 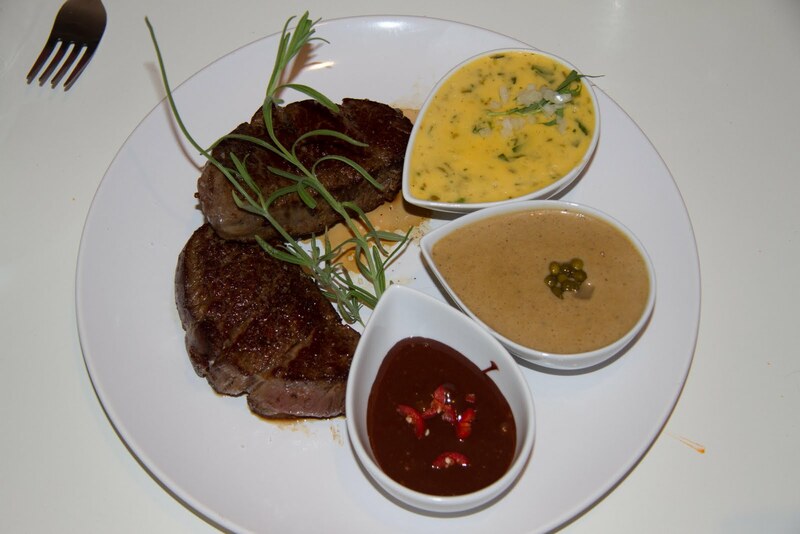 Next up came some extremely good quality beef fillet cooked with three different sauces. The first was a classic tarragon Bearnaise, the second was a classic fresh green pepper sauce and the third was a dark chocolate, orange and chilli sauce. The first two sauces went fine, but the third, during cooking was almost a disaster as the chocolate split from overheating. I remembered that in McGee, the cooking/science bible, there was a section on emulsifiers (which bring together chemicals which will otherwise not mix - eg. fat and water), and realised that adding an egg-yolk to the cooled mixture should, in theory do the trick. In fact it worked like magic and before our very eyes the mixture came together again and thickened, on heating over a bain-marie into a velvety sauce again. The fillet, cooked quickly in a copper pan with a little butter and then left to rest for a few minutes was spectacularly good, and the three sauces were frankly very impressive (Note that I can't take credit for these sauces, though I can for the saving of the chocolate and chilli). 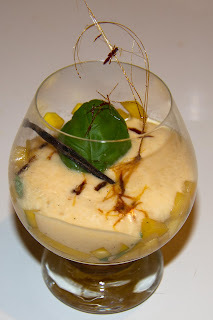 Finally, there was a mango sabayon and the calorie content went yet higher with white wine and a little brown sugar cooked over a bain-marie before eggs yolks were added and whisked until foamy. I've always used the Italian recipe (zabaglione) which starts off with a fortified sweet wine, but this worked great on its own. The garnish was basil, which goes very well with mango, and I added a little spun sugar to top it off. Anyway, In the end we had two very happy chefs, and what appeared to be four other very happy customers and this is certainly going to be repeated in the near future.